The 29-year-old has been in and out of prison for selling drugs. His incarceration resulted from growing up in Youngstown, White says. 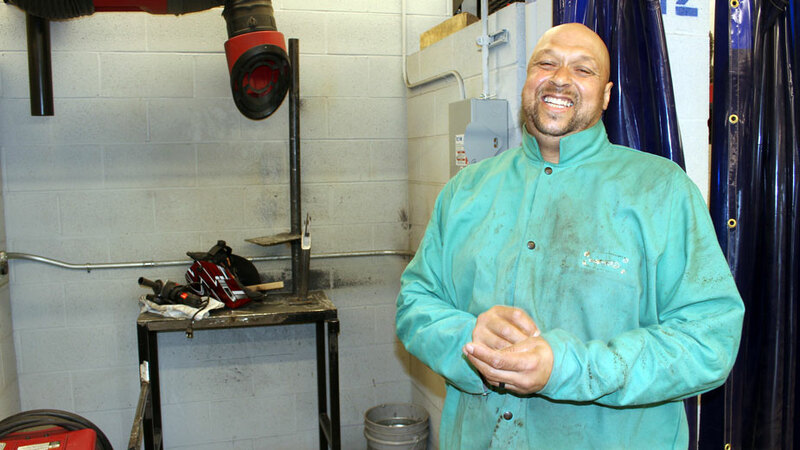 Rontrell White says the birth of his daughter inspired him to pursue a welding career. Now the father of a three-year-old daughter, Breniyah, White wanted to change his life, he says. He’s nearly completed the training and will start work at J.A. McMahon Inc. in Niles after graduating. More important, he’s stopped selling drugs and is working toward getting things back on track to care for his daughter. Helping people turn their lives around and find gainful employment is the primary focus for Flying High, says its executive director, Jeff Magada. The 501(c)(3) nonprofit provides 16-week accelerated and accredited vocational training programs at its Professional Development Center on Bissell Avenue in Youngstown. In 2000, Jeff Magada expanded the scope of Flying High Inc. to include adults. 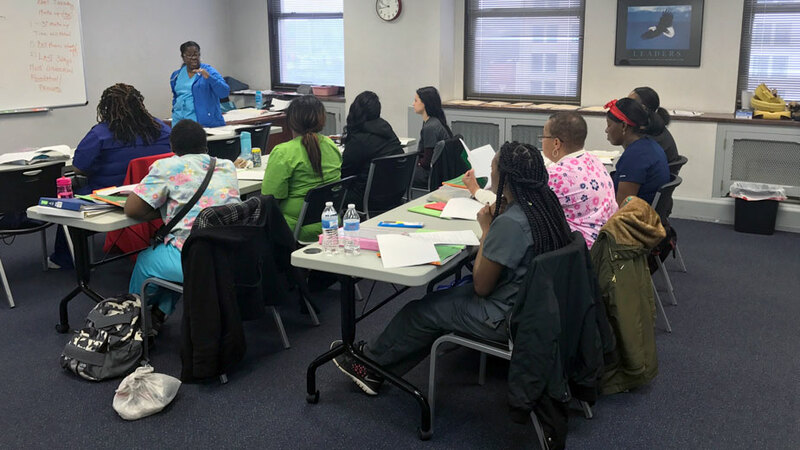 In addition to its welding and machining programs, Flying High offers training for state tested nursing assistant, licensed practical nurse and registered nurse as well as chemical dependency counselor assistants. GED preparation and work experience training with the nonprofit’s GROW Urban Farm give students additional professional skills. And instructors teach participants soft skills, such as developing a professional resume, job search, interview skills, professional attire, behavior and communication. Flying High offers training for STNA with opportunities to continue to LPN and RN. The program is much more comprehensive than when Magada started the League of Champions sports program in 1994. Then he was a juvenile diversion officer for the Austintown Police Department and working with at-risk high school students, he says. As the students grew, their needs changed, whether it was going to college or getting a job, he says. In 2000, Magada left the police department to work full-time with the newly minted Flying High Inc. to serve students and adults. Expanding the scope of the organization allows it to address a prominent issue in the region – a shortage of employable skilled workers who can pass a drug test. Last year, Quest Diagnostics reported that 4.2% of the U.S. workforce tested positive for illicit drugs in 2016, the highest rate since 2004. In 2017, The New York Times reported that nearly half of job applicants in the Mahoning Valley fail a drug test. Small to medium-sized companies that don’t have a full human resources department need the most help, Magada says. “They’re just trying to take whoever they can get, put them on the job or hire them through temp companies. And they keep them on for 90 days and they see who sticks,” he says. Outpatient nutrition-assisted alcohol and drug treatment services and transitional recovery housing at Flying High help recovering addicts speed recovery, prevent relapse and promote general wellness, says Elydia Martinez, nutrition assisted treatment program coordinator and a graduate of the chemical dependency counselor assistant (CDCA) program. Marijuana, alcohol and opiates are the top substances abused locally, Martinez says. Each person has different triggers that can cause relapse, such as domestic stress, education and jobs. Working with a group of people who have the same issues helps individuals cope, she says. “When they talk about it, they help each other to overcome those triggers,” she says. Flying High keeps in touch with its graduates to get them additional help should they need it, even if it means going through the treatment process again, Magada says. As the lead agency for the Mahoning Valley Partnership for Employment program, Flying High collaborates with 24 employers in the manufacturing and health care industries who advance students’ education with six months of on-the-job training. 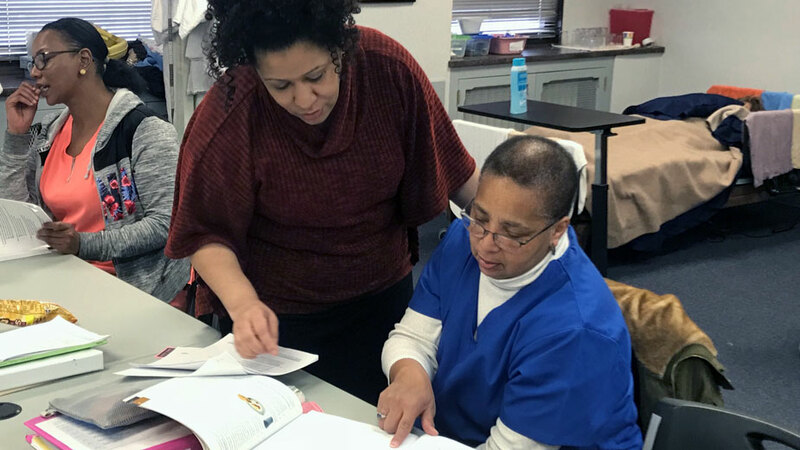 Partnerships with other schools, including Eastern Gateway Community College, Choffin Career & Technical Center and the Hannah E. Mullins School of Practical Nursing in Salem, provide more advanced training to students ready to move forward in their careers. As of January 2017, Flying High had graduated 72 students and enrolled about 300. Classes are at capacity. “When you see the work that they do and the clients they’re working with, you’re just like ‘This is good. This is what we need,’ ” says Mary Williams, who sits on the board of directors. Williams, who has a background in finance, met Magada while giving tax code instruction to Flying High’s students. She joined the board because of its mission to address the skilled labor shortage in the area. 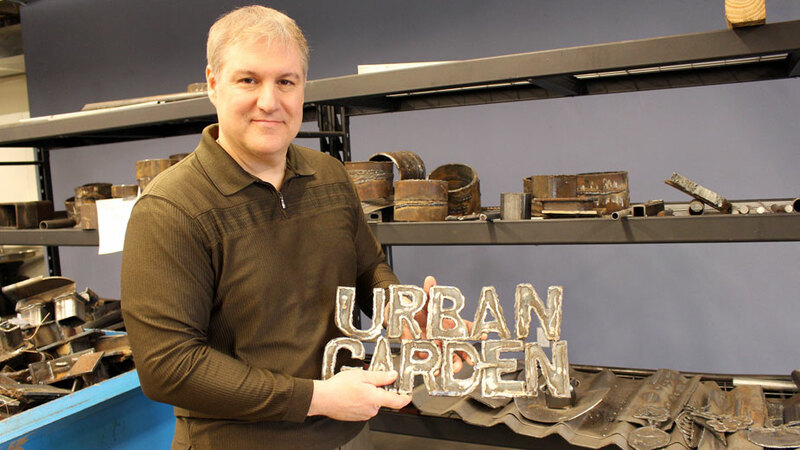 The work earned Flying High a $4 million grant in November through the U.S. Department of Labor’s TechHire initiative, the only organzation in Ohio to receive such an award. The grant allowed the nonprofit to open its welding school and create a tuition assistance fund. 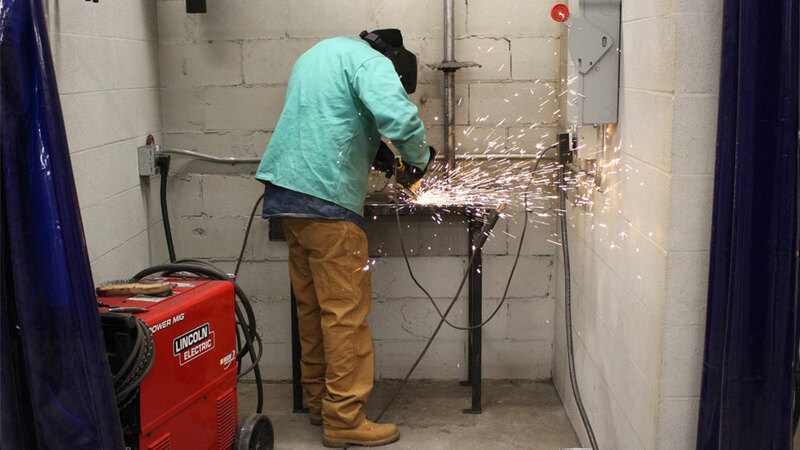 Tuition for the welding program is $3,295, but 100% of students have received some tuition assistance, Magada says, with some paying out-of-pocket costs of $300 or less. “Individuals walk away from this accelerated program with no student debt,” he says. Tuition for Flying High’s state tested nursing assistant program is $595, and $875 for its CDCA program. Alexis Harris, case manager, works with nursing assistant student, Alberta Lisbon. New applicants go through a rigorous vetting process with a five-day bootcamp that measures attitude, aptitude and attendance, Magada continues. Applicants who miss one day aren’t admitted into class. It’s something that Donald Slocum takes to heart. Slocum is five weeks into his welding training and he shows up early every day to prepare his welding station. After going through addiction recovery treatment at Neil Kennedy Recovery Clinic in Austintown, the Community Initiative to Reduce Violence in Youngstown helped Slocum attain his certificate of qualification for employment and enroll at Flying High. Donald Slocum arrives early every day to prepare his welding station. 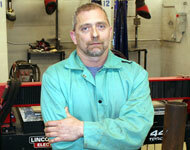 Attendance is drilled into students from Day One, says Tim Hipkins, lead welding instructor. Employers want workers who show up every day, so Flying High has students clock-in with a time card. 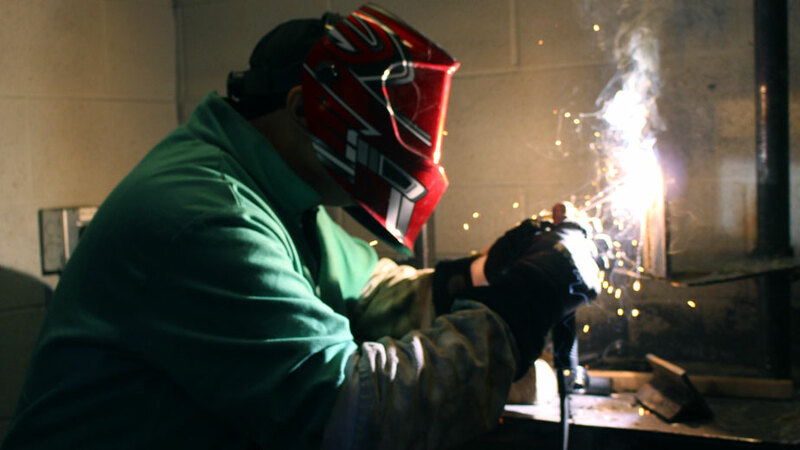 For the students at Flying High’s welding program who have been incarcerated, battled addiction, or both, the road to health can be a difficult one to walk. Nobody knows that better than lead instructor, Tim Hipkins. A welder by trade, Hipkins did all the right things in life, he says. He had a wife, three children and a job teaching welding at an apprenticeship program. Then about 14 years ago, things took a turn for the worse. Hipkins became addicted to pills, which led to heroin and, eventually, prison. While in jail, Hipkins lost his job, his wife and his children. He used the time to reflect on the choices he had made and the people he had hurt. He credits his relationship with his family with his ability to get sober. They looked at his arrest as an opportunity for him to get a fresh start, he says. After he was released, Hipkins started to get his life back on track. He reconnected with his 20-year-old son, although he still doesn’t speak with his ex-wife or two daughters. 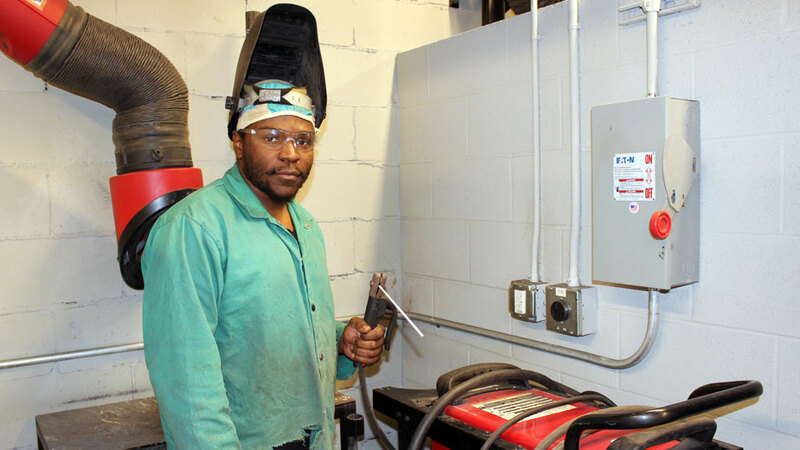 Then about eight months ago, he saw a job opening for a welding instructor at Flying High. He wasn’t looking to get back into teaching and hadn’t heard about Flying High or its founder, Jeff Magada, but wanted to come in for the interview anyway. As lead instructor for Flying High’s welding program, Hipkins is as much a mentor as he is an instructor. While teaching them the skills they need to be employable comes first, he often finds himself talking to students who get worked up and need to take a quick break, he says. While mentoring isn’t always intentional, he says his past helps him relate. “I’ve been down that road. And I know how hard it is to get off of that road,” he says. Hipkins, a resident of Alliance, says he sees the value that Flying High and programs like it could bring to other areas. And while he’s glad to see the benefit to Mahoning County, he wishes he could see more programs like Flying High doing the work in every county in Ohio. Classes are five hours long with a 30-minute break. The first hour is spent in the classroom to discuss welding processes and the work for the day. The rest of the time is in the shop where students learn shielded metal arc, metal inert gas, flux core and tungsten inert gas welding. Jason Hymes was skeptical of the program when he first heard about it from a friend. He had been in prison twice and was using drugs and had been through other programs that didn’t pan out like he expected. In addition to job training, Flying High helped him with his utility bills during the six months he was incarcerated, he says. After graduation, Magada asked Hymes to be an assistant welding instructor. Hymes saw this as his chance to give back to the program that had helped him in his time of need, he says. He promotes the program too, whether on Facebook or to his friends. Community members can make a positive impact on Flying High Inc. by donating to its Professional Development Center scholarship fund, or by volunteering at the GROW Urban Farm and mentoring individuals making the transition to employment. Although tuition-based, Flying High has provided financial assistance to 100% of its students through the scholarship fund and through the Mahoning Valley Partnership for Employment. Donations can be made to Flying High Inc., 6 Federal Plaza Central, Suite 701, Youngstown, OH, 44503. The GROW (Gaining Real Opportunities for Work) Urban Farm provides workforce development and job readiness training by helping individuals gain real work experience with hands-on training in horticulture, greenhouse operations, organic land care, irrigation, business, marketing and basic carpentry. Produce is provided to nearby community supported agriculture programs, restaurants, food pantries and residents living in areas regarded as food deserts. Those interested can contact Flying High offices by calling 330 797 3995.